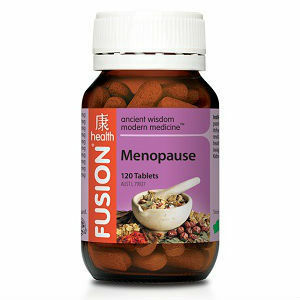 Fusion Health Menopause contains herbs traditionally used to assist in the management of menopausal symptoms. It combines five traditional Chinese herbs with two extensively researched Western herbs, Black Cohosh and Vitex. The Chinese herbs used provides cooling, moisturising and nourishing effects to help alleviate menopausal symptoms. Other specific benefits include aphrodisiac, analgesic, anti-stress and anti-fatigue effects. Chinese Asparagus root, called Shatavari in Ayurvedic medicine, is considered a rejuvenating tonic for women. Black Cohosh and Vitex are scientifically proven to help regulate hormonal balance and support women’s health throughout all stages of menopause. Take 1 – 2 tablets once or twice daily. Best taken one hour before a meal. If you would like to take an extra dose, please consult an experts’ advice. If symptoms persist, consult a healthcare practitioner. Fusion Health Menopause is one of the best product in the market that relieves menopausal symptoms. It also uses traditional herbal ingredients. Jackie Horowitz	reviewed Fusion Health Menopause	on March 12th	 and gave it a rating of 3.5.